Bromstone Primary School has become the first in the county to officially offer sanctuary to anyone in danger or experiencing troubles. The primary is the first School of Sanctuary in Kent and joins a growing number across the UK. A School of Sanctuary is committed to being a safe and welcoming place for all, especially those seeking sanctuary. This could be people whose lives were in danger in their own country, who have troubles at home or are just looking for a space of safety. 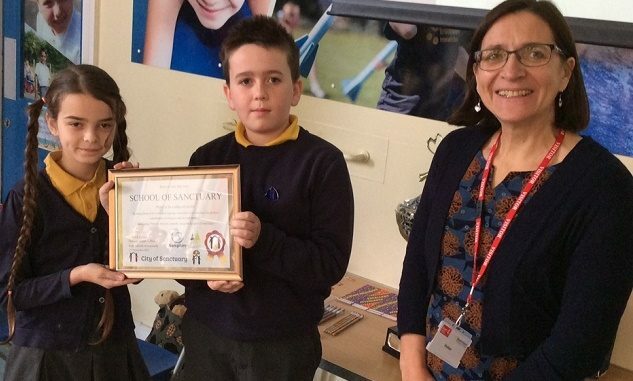 Teacher Warren Chambers said: “We have been covering sanctuary in our topic for some time and then we heard of the Samphire Project based in Dover which was looking for a support volunteer to assist in delivering the Schools of Sanctuary workshops in Kent. “These workshops feed into the school’s curriculum and are part of becoming a recognised School of Sanctuary.​ We invited them in to talk with our year 3s. “I have also been working towards twinning our school with others around the world. Having done some training with Amnesty I have shared this with the school council and my year groups and we worked on doing things through refugee week.